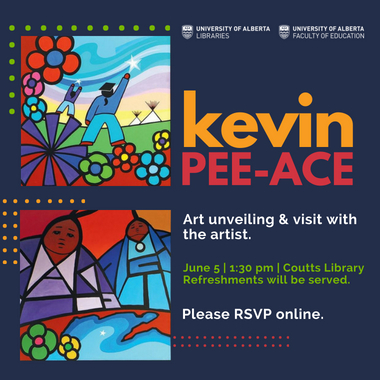 We welcome everyone for the unveiling of a new painting by artist Kevin Pee-ace at the Coutts Library. 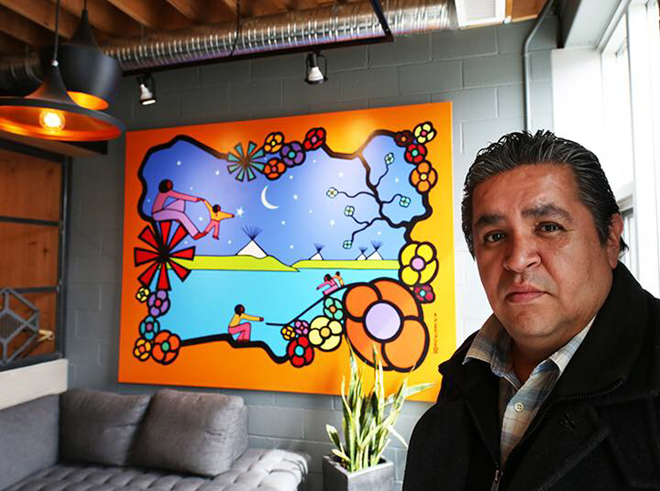 Kevin Pee-ace was born in Kelvington Saskatchewan and is a member of the Yellowquill First Nation. We are delighted that he will be in attendance at this event and will speak about his art. Elder Francis Whiskeyjack will also be in attendance. 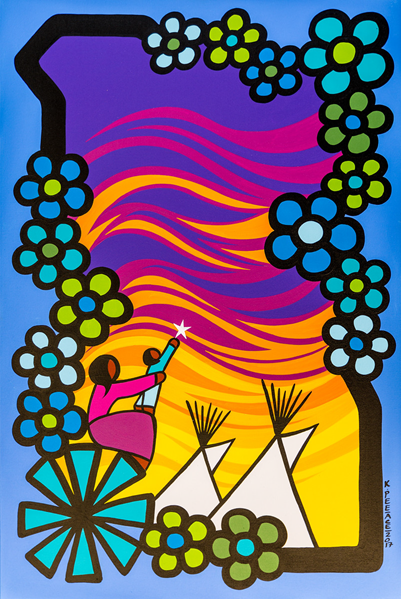 Limited edition prints by the artist will be available for viewing and for sale. Refreshments will be served. Location: Main floor of the Coutts Library, Education Centre, 11210-87 St.
Congratulations to Sarah-Jeanne Bélec and Elisabet Ingibergsson of Bibliotheque Saint Jean who were recognized by the Campus Saint-Jean graduating class of 2018. The Campus Saint-Jean and the Alberta College (CCA) graduating class of 2018 celebrate their post-secondary years by recognizing the people who have had the greatest impact on their studies. 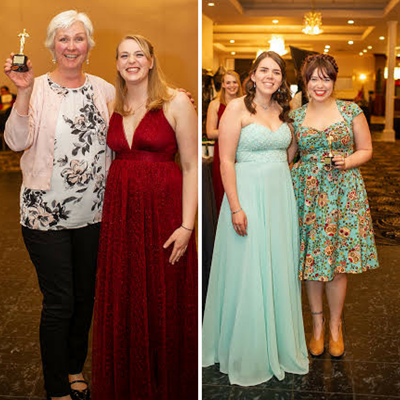 Elisabet and Sarah-Jeanne were selected as two of those people and received an "oscar" (the theme of their gala) as library staff of the year on Saturday April 28, 2018. On February 28, 2018, the University of Alberta’s Copyright Office hosted a day-long event in celebration of Fair Dealing Week, an initiative by the Association of Research Libraries (ARL). More background information about the event is available here. The event featured four speakers from various disciplines, who talked about the impact and importance of Fair Dealing as a user right in the Canadian Copyright Act. This discussion was followed by a spirited Q and A, which emphasized the need for users and creators alike to come together to voice their copyright needs and concerns as we enter the review period of the Canadian Copyright Act. The director of the University of Alberta’s Copyright Office, Adrian Sheppard, delivered a talk on the necessity of having, as well as possible issues and areas for improvement when using, institutional Fair Dealing Guidelines. Adrian stated that guidelines can always be improved, and reviewing them (when the time is right) makes good sense. Adrian emphasized that the guidelines were not intended as a substitute for a fair dealing analysis, but rather were intended to offer a quick and easy guide to determine fairness across a broad range of likely cases in a particular context (such as at a post-secondary institution). Guidelines are only intended as a shortcut; fairness remains the standard. He outlined certain situations in which the AUCC fair dealing guidelines may not always yield a fair outcome (such as when applying a 10% or one chapter guideline to an anthology of complete plays), questioned whether fiction and non-fiction, or scholarly and popular works, should be dealt with in the same way under the guidelines, and explored the difficulty of trying to develop a simple, easy to apply, set of guidelines that would appropriately address 100% of copying done on behalf of an institution. If there cannot be a perfect set of guidelines, how good is good enough? Chris George, president of an Ottawa public relations firm and a registered lobbyist for the Council of Minister of Education, Canada (CMEC) Copyright Consortium, travelled from Ottawa to showcase the conversation about copyright currently underway on Parliament Hill, and to highlight what is and what isn’t being discussed. Chris suggested that it’s those acting on behalf of the creators (such as big academic publishers, or the Access Copyright collective) who are making the most noise, seeking changes to the Copyright Act that limit, or even eliminate, the educational exception in the fair dealing provision, which could effectively reverse 10 years of legal decisions, and cancel out existing fair dealing guidelines. Chris stated the importance of helping MPs understand that fair dealing is not a blank cheque and the fair dealing guidelines set reasonable conditions, and students across Canada greatly benefit from the access to educational content allowed by this provision..
Michael McNally finished the day with a simple call-to-action: get involved! As the 2017/2018 5-year statutory review of the Copyright Act commences, Michael stressed the importance (and rising trend) of making your voice heard through public engagement, as the government actively wants to listen to people, and not just corporations and other established voices. Copyright affects us all in that we are both creators and users, and as much as creators are incentivised to participate, users must also contribute their voices, as copyright is as much a user right as it is a creator’s right. There is real value in participating in this review and consultation, and it’s fun to engage in intellectual battle! Start writing to your MP’s now; even if you have only one strong argument to contribute, or if you simply agree with other prominent voices in the Canadian copyright landscape, it’s important to make your opinion heard.